The winners of today’s state and national elections face some daunting budgeting tasks. Compounding those difficulties is the fact that winners will likely begin their efforts having disappointed close to 50 percent of the people who care enough about their country and state to exercise their right of franchise. Its hard to set a course when half the oarsmen and women are are using them to poke you in the eye rather than right the ship of state. This is not a circumstance unique to this election, but what does seem different is how many people think they still win even when their candidate loses, if the country or the state fail to prosper under the administration of the victor. Some may have, but I never have been better off when the economy is weak, so whether or not my candidates win today, I’m rooting for prosperity. In NH, today’s winner of the race for governor will confront pent-up demand for limited state resources that show no near-term signs of significant increase. The state’s largest source of general fund revenue, the combined business profits and business enterprise taxes, has shown limited growth recently. In the past, this source of revenue has demonstrated an ability to rise quickly and dramatically as the state’s and nation’s economies rebound, but a severe recession and changes to the state’s business loss carry forward provisions will dampen some of these effects that typically occur early in a recovery. 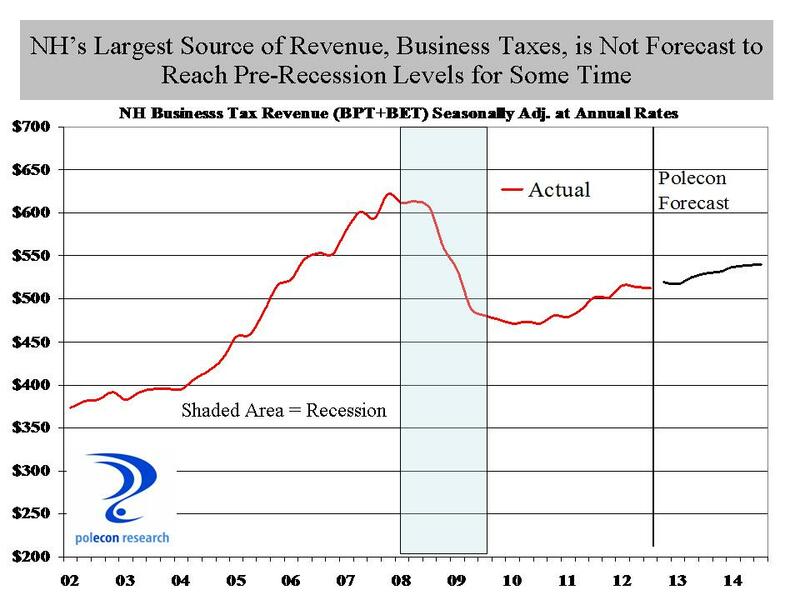 The chart below shows the seasonally adjusted, annualized, business tax revenue over the past decade, along with our forecast for the next two years. This forecast uses a statistical model (ARIMA) that makes no assumptions about changes in the strength of the economy and it indicates that, without significant changes, business tax revenues can be expected to increases by about 5.3 percent over the next two years. We will update the forecast as new data becomes available as well as use modeling that incorporates key assumptions about changes in state and national economic variables, but as it stands now, it appears that little of the pent-up demand for state spending is likely to be satisfied under the current path. This entry was posted on November 6, 2012 at 12:23 pm and is filed under Election, Fiscal Policy, Recession, Tax Revenue. You can subscribe via RSS 2.0 feed to this post's comments.